I used to drive a 94 Celica, he was an absolute beaut, black fast low maintenance and totally beaten up from the previous 5 NZ owners (failed attempts at parallel parking). I named him Axle because I found him out west and test drove him to Guns N’ Roses, he was the inferior brother of a silver sky line, a runner for the lady of the house who told me barefoot with her tangles on repeat he just “wasn’t really fast enough” but he’d been good for trips to Pak n Save. I kind of had the feeling Axle was on the cusp of being a lemon, there was a chunk of panel missing on the passenger door, he came complete with a complimentary vivid to colour in his white car park marks – brushes with poles and walls and corners of buildings. I think that horrible consumer thing happened, where I saw a bit of myself in the purchase, Axle was low on k’s, a bit scuffed up but kind of fearless. I liked that his wounds were on display and decided that he was an artist. Axle had an alarm, it was super sensitive . He would look all cool and calm parked up under a tree, a car would pass too close and that was it – a litany of insane sounds would blare. They ranged from your average siren through to a kind of demonic howl. He hated trucks, anything that shook the road. In the night I would sleepily reach for my keys and beep him through my bedroom window. We were so gangs. Today when I was walking home from work, I heard that same alarm on the way up Gray’s Ave, true to form I couldn’t sight the vehicle it was coming from – it could’ve been parked in Grey Lynn, or South Auckland (it’s that loud). 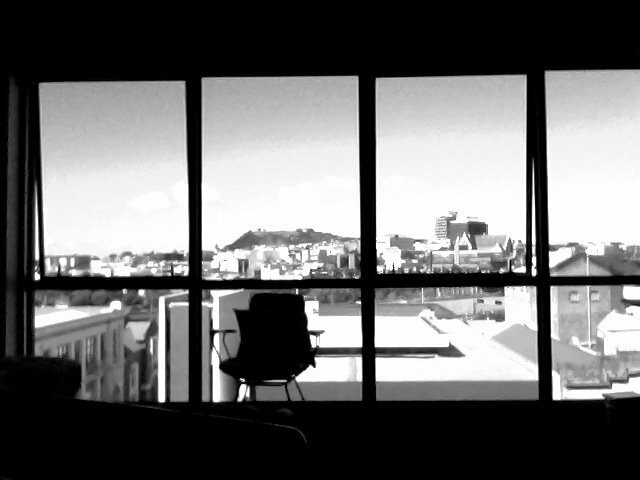 My apartment on K Rd looks out to Mt Eden and far into the heavens. I can see the Waitakere ranges and where the southern motorway bleeds into oblivion. I think the alarm might have been Axle, trying to get his credit for an especially windy part of the journey. I thought I saw him on the southern motorway, going hell for leather. Love this piece, so reminiscent of youth… ahh.